Turn back the clock to 2010 and out­sourcing company Amey “had abso­lutely no presence whatsoever in environmental services”, explains Rob Edmondson, managing director for the company’s environmental services division. Today, its turnover is just over £350m after a number of strategic acquisitions and “some very targeted growth”. I meet Edmondson at Amey’s Milton Keynes waste recovery park (MKWRP), now fully operational. After a thorough health and safety (H&S) briefing, com­plete with Powerpoint presentation and an unannounced questionnaire to check our understanding of the rules, we donned full personal protective equip­ment and toured the facility. 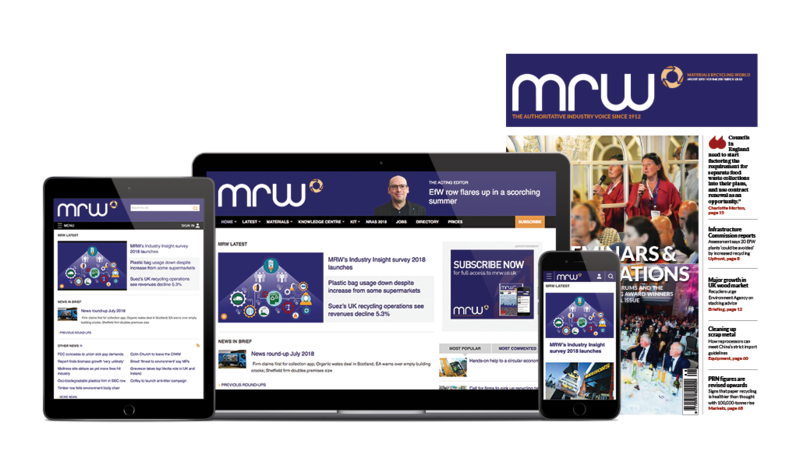 MKWRP was constructed by Amey on behalf of Milton Keynes Council and brings together three technologies – mechanical treatment, anaerobic diges­tion and advanced thermal treatment (gasification) – to both recycle and cre­ate energy from waste (EfW). What makes it unique is its bringing together of these technologies rather than “just putting waste directly into the gasifier”. The objective is to extract as much recy­clate from residual waste before it goes through thermal treatment. The choice of gasification was “very much selected by the client”, according to Edmondson, because it was keen to attract the Renewables Obligation Cer­tificate subsidy. But that gasification element provided the greatest challenge because, during the plant’s construc­tion, Energos, the gasification technol­ogy provider, went into administration. This meant that, at a stroke, the project lost its main contractor and related expertise. Edmondson explains that it was “75% of the way there when we had to effectively step in as the Tier 1 con­tractor” and put together the rest of the plant. MKWRP has the capacity to process around 130,000 tonnes a year of waste. The input is made up of around 80,000 tonnes from Milton Keynes Council and the rest will be filled by merchant con­tracts. For the next three years it has secured that waste from neighbouring local authorities and local commercial operators, including the commercial waste it collects itself. But Edmondson explains that, during the 15 years of the contract, there is the opportunity for it to attract waste from other commercial inputs. There have been high-profile break-ups of long-term deals between councils and their waste service providers. In April, the Environmental Services Asso­ciation launched a campaign to pro­mote the use of outsourcing to deliver cost savings and drive innovation in service delivery for local authorities and their residents – a response to the increasing number of councils moving away from competitive tender proce­dures for their waste services. Of this relationship, Edmondson says a one-size-fits-all approach does not work and you might have to work with customers “who do not necessarily want to work with the private sector to deliver those services”. He adds that it is impor­tant to recognise that local government is “not only driven by economics but also political pressure around how ser­vices are delivered”. He cites the Surrey joint waste part­nership contract, in its final stages of roll-out, as showing it can deliver “high-quality services at a competitive price and do it on a timely basis”. He adds: “There were a number of challenges which we had to overcome at the very early stages of the contract, which I think under normal circumstances you wouldn’t have foreseen.” But he says the key performance indicators now show that it is stable and delivering effectively. The challenge to the wider imple­mentation of such collective working is having a standard approach and meth­odology for collecting both residual waste and recyclables. “The one thing we have seen in Sur­rey is that they have been committed to having the same service delivered for the four authorities, so you can poten­tially take the full benefit of the synergy of working effectively over a wider geog­raphy,” he says. Standardisation of household collections would make effi­ciencies for councils more achievable. “Most of our facilities are predicated on the basis that they will have an anchor client, currently a local author­ity,” Edmondson says, when asked how reliant Amey is on councils. “If you take our Waterbeach EfW development, that is a pure merchant development. So we recognise that we will have a mix of both local authorities and commercial cus­tomers making up our portfolio. Would a council contract always be needed for a new facility? “It depends on how we invest in it. It is great if you can have a local authority anchor to contribute to the input, but that does not necessarily mean it is not possible for us to deliver the solution. He says Amey’s strategy “isn’t about being a national operator”, it is not nec­essarily about being ‘the biggest and the best’ – “it is about looking at where there are opportunities and gaps in the mar­ket to create long-term merchant facil­ities. And those facilities will provide outlets to local authorities which have yet to determine long-term solutions for their waste arisings, and also opportu­nities within the commercial sector”. Amey runs four facilities – Milton Keynes, Allerton in North Yorkshire, Waterbeach in Cambridgeshire and Isle of Wight – and Edmondson says the business has shown it can bring “an innovative and creative way” to funding projects. He reveals that it has “a number of pipeline opportunities” and is looking at expansion into other facilities, “but again that will be driven by the availability of waste in that particular geog­raphy”. I ask how Amey ensures its facilities are future-proofed. Edmondson recog­nises that implementation of a deposit return scheme (DRS) or even pay-as-you-throw would affect the residual waste that its facilities treat. As an example, Edmondson explains that if a DRS resulted in an incoming waste stream that had no plastic, cans or glass to recover, then the plant could be converted into “some form of grading or some other form of treated recyclates into a more refined fraction”. There would also be the opportunity to bring in organic waste if this fraction was no longer available in the residual waste. At Amey’s Isle of Wight facility, the mechanical treatment line runs on an alternate daily basis: “One day it splits and sorts the residual waste and on the second day it grades plastics, cans and glass. So the technology is able to be configured to that degree of flexibility. Appointed to his current role in 2016. He is responsible for the management of multi-location operations and oversees Amey’s municipal and commercial waste services. This involves working with over 20 local authority clients and around 9,000 commercial waste customers. Before joining Amey in 2013, Edmondson worked for more than 25 years in the sector including roles at Veolia, Cleanaway and the London Borough of Lewisham.